There is no doubt about it… we are a proud Lego household! From my 14-year-old to my 7-year-old (and Mom and Dad too! ), you’ll find Legos in bedrooms, the play room, on backpacks, playing on video game consoles and tablets, on t-shirts, ringing alarm clocks, on the wrist, and just about anywhere else you can imagine. But while building new sets with the instruction manual is fun enough, there are so many other ways to enjoy these amazing toys as well. Here are 12 totally awesome ways to think outside the brick! Develop those engineering skills by designing a vertical Lego run maze. Challenge Little Builders to think of ways to incorporate moving parts and levers. Frugal Fun 4 Boys and Girls offers some great tips to get you started. Look out below! This Lego zip line is such a perfect building project to teach your Little Adventurers about gravity and the laws of motion. Who said Sir Newton couldn’t come along for some fun and laughter!? Source. Bridge the gap with this STEM activity. See if your Aspiring Engineers can defy the laws of gravity by constructing a bridge worthy of it’s heaviest foes. This is another perfect activity for teaching about forces and simple machines as well. Read more here. Paper and pencil is so last decade! Play a “real” game of hangman using Lego pieces. What an excellent way to practice spelling words at home!! Get all the ABC’s for this DIY here. Grab your toddler for a game of Monster Match. Start by having your child create colorful paper bag monsters with open mouths. Then, learn all about colors by placing color-matching Legos in the appropriate monster’s mouth. Cookie monster has nothing on these monster friends! Read more from Toddler Approved. This great activity is non dispensable for sure! Teach Young Builders all about simple machines with this candy dispenser project. Get the how-to here. Keep Little Learners busy mastering their ABCs with this Lego activity. Have them replicate the Lego letters shown on cards by building one themselves. How many words can you think of to spell with that letter while you’re constructing what you see? Get the free printable letter cards here. Little Mathematicians will have no problem mastering their counting skills with the help of Duplo Lego bricks! SHOW them representations of each digit by counting them out and stacking them in order. Similarly, 7-year-old and above can master their times tables by stacking Lego arrays and seeing how multiplying two numbers gives you a new product. Such a more exciting way to learn math than with worksheets! Channel extra energy onto the racetrack for the afternoon. Have your Mini Mario Andretti’s design race cars to duke it out in some epic car races. 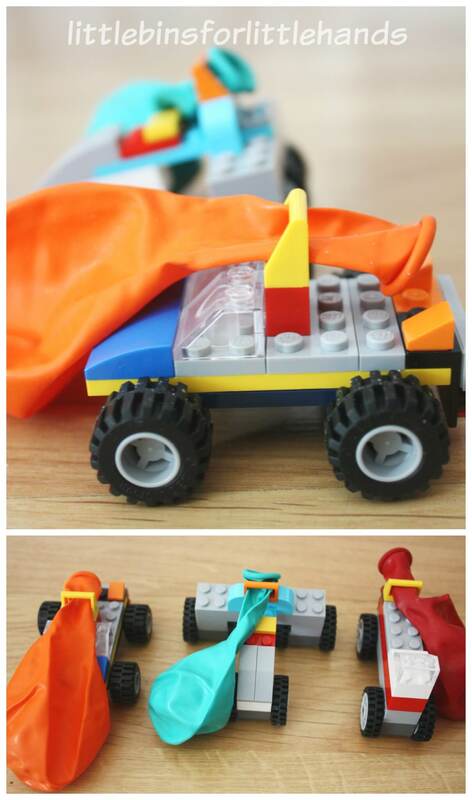 Use balloons to give the racers their acceleration. Don’t miss the opportunity to teach about forces and motion with this fun activity! Athletes and competitors will enjoy this Lego build. Have them construct a DIY foosball game and then play for additional hours of more fun. Get a kick out of this activity here. Kids won’t need to weigh their options when it comes to building a neat Lego balance. What a cool way to learn about measurement and different metric scales. Get the instructions here. Take advantage of all the hype with fidget spinners and get your Little Engineers constructing! See if they can figure out how to get the parts to move. These are so much cooler than store bought fidget spinners anyway! Find some non-dizzying ideas here.